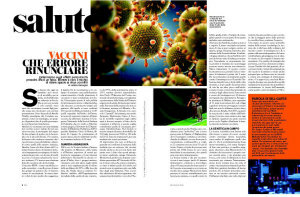 Emanuele Montomoli, in the role of Professor of Hygiene and Preventive Medicine at the University of Siena, is one among the experts interviewed by Letizia Gabaglio on the subject of vaccination in the article “Vaccini, che errore rinunciare” published this week on the weekly D Repubblica. In the article, there are questions as to what are the dangers of the growing alarmism about the risks caused by vaccines, which is leading to a decline in vaccinations. “It’s important not to let your guard down against any of the diseases for which vaccines exist, because even though we are no longer afraid, it is not always true that these pathogens are fully eradicated” – explained Prof. Montomoli.